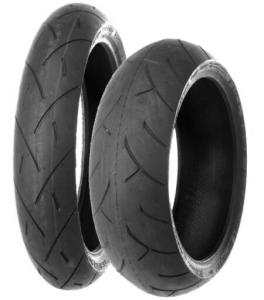 When it’s time to replace your OEM radial, this ZR Rated General Purpose superbike tire offers the perfect blend of handling and longevity. The Street Sport is reasonably priced and offers the best overall value in it’s class! The tread and construction offer superior traction even in the most varied of weather and road conditions. Japanese engineered and precision manufactured to deliver top performance. Even the most demanding rider will appreciate the unparalleled traction and control that the Full Bore Sport Bike Radial Tires offer.